Edmond Hamilton (1904-1977) was one of the true giants of golden age science fiction. He managed to create the space opera sub-genre and crank out a series of pulp novels under the Captain Future imprint. There are stories of him typing so fast the typewriter would move across his desk. Later he would marry fellow writer Leigh Brackett and they would collaborate on many other novels. However, as he was constantly writing, Hamilton was loath to see his earlier works into print. Much of what he published in the 30’s and 40’s didn’t see print again until after he died. In the late 1960’s, Hamilton wrote three novels as part of an sf series. Series novels were all the rage at the time and someone had decided an outer space theme might prove successful. Known as the Starwolf trilogy, they consist of three separate novels:The Weapon From Beyond, The Closed Worlds and World of the Starwolves. 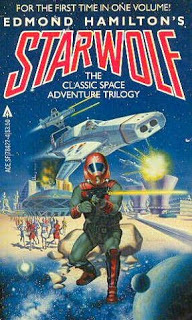 In 1982, Ace Science Fiction issued them as one paperback collection, Starwolf. I’m told the first novel was adapted for Japanese television in the late 1970’s, but I haven’t had a chance to see it. The trilogy follows the adventures of Morgan Chane, fully human, but adopted by theStarwolves at an early age. In the far future, his missionary parents had traveled from Wales on Earth to Varna, the home planet of a race of humanoid interstellar raiders, known as the Starwolves. Chane’s parent’s had hoped to save the Starwolves from their savage ways, but the missionaries perished from the excessive gravity and climate of Varna. Chane was raised by the Starwolves, who resemble human tigers with their golden fur. Later, when he came of age, he went with them on raids all over the galactic rim in search of treasure and booty. All of it came to an end when he killed a Starwolf in self- defense while arguing over the spoils of a raid. With an entire extended clan of Starwolves after him, he was forced to flee in a damaged spaceship. 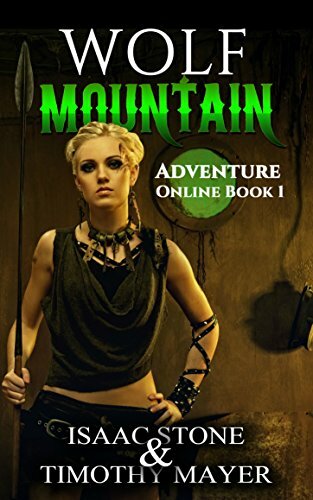 Chane survives long enough to join up with a band of human mercenaries from Earth. Earth, now an impoverished planet, does supply most of the paid guns in the galaxy in the form of soldiers-of-fortune. Chane decides to stay with the mercenary band which rescued him. However, none of the other mercs, save the band’s commander, Dilullo, know that Chane is a former Starwolf. Since Starwolves are usually shot on sight, they decide to keep his origin a secret. The first novel, The Weapon from Beyond, touches briefly on Chane’s origins. Most of it involves the mercenary band he’s joined and their mission. A planet with vast mineral wealth has hired the mercenaries to seek out and destroy a weapon of vast power which they believe possessed by a rival planetary system. The mercenaries do find the weapon, but it turns out to be a star ship left over by an ancient intergalactic race. Chane earns respect from his new brothers-in-arms as the Varnan gravity of his youth has conditioned him to be far more powerful than the average human. The next novel, The Closed Worlds, has Chane and the mercenaries traveling to a planet in search of a missing scientist. The brother of a rich star freight owner has disappeared on the planet Arkuun while searching for traces of another ancient Interstellar civilization. Their mission is ultimately successful, but not before Chane has encountered the radiantly beautiful Arkuun woman Vreya. The series concludes with World of the Starwolves, easily the best one of the series. In this novel, Chane is forced to return to the Starwolf home planet of Varna and deal with the blood feud which cast him out. Searching for a missing work of art known as “The Singing Suns”, Chane has led the other mercenaries into a trap. Although Chane manages to escape, the only way to free the other mercs is by leading the Starwolves to the very treasure planet where the stolen Singing Suns are kept. As before, Chane escapes with his strength and guile. The quality of the writing varies. Most of the time it is standard action-and- adventure, with little thought given to the science behind Chane’s galactic civilization. But no one could write about “booming suns” better than Hamilton. Toward the conclusion of the second novel, Chane encounters a device capable of transferring consciousness to any point in space. Here, the book enters 2001: A Space Odysseyterritory with the wonders of the universe a-glow. It’s a shame the series ended after three books. I would’ve like to have seen where Hamilton would’ve taken Morgan Chane.